Choirs? Check. Bells? Check. Brass? Check. 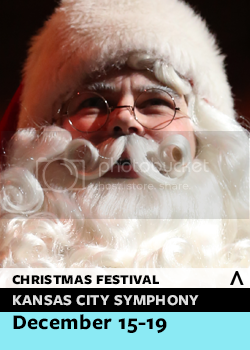 Watch out, Santa, the Kansas City Symphony has made its list and checked it twice as the ensemble prepares for five separate concerts this December, including KC’s grandest holiday concert tradition, Kansas City Symphony’s Christmas Festival. 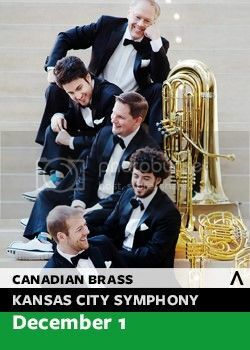 CANADIAN BRASS: CHRISTMASTIME IS HERE! Hark! The herald trumpets sing — along with French horn, trombone and tuba in this most wonderful holiday concert together with your Kansas City Symphony. These five brass masters always amaze audiences with their exquisite ensemble playing, wide-ranging repertoire and the sheer joy of their music-making. Hear classic carols, sacred music along with fun Christmas tunes, such as the treasured A Charlie Brown Christmas. Tickets from $35. Learn more. Celebrate TubaChristmas in Helzberg Hall on Monday, December 4 AND Friday, December 8! All area tuba and euphonium players are invited to join in the festivities. All are welcome at the FREE lunch-hour concert to listen to the sounds of the season, tuba-style! Advance registration and a fee are required to perform. Call (816) 218-2639 for more information. 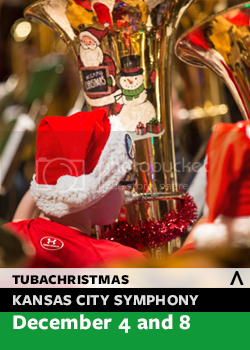 Janet M. Stallmeyer and Donald L. Flora generously underwrite TubaChristmas. This mosaic of the scriptures remains Handel’s most famous work, and it is one of the most triumphant choral pieces ever written. 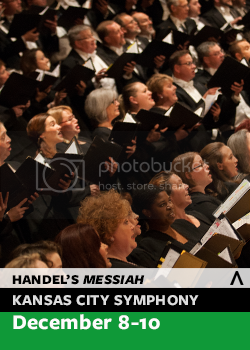 The impeccable acoustics of Helzberg Hall together with your Kansas City Symphony and Chorus make this THE Messiah performance of the season! With nearly 200 musicians and inspired special guest vocalists on stage, Messiah is sure to impress and delight you. Sponsored by Thrivent Financial. Adult tickets from $25 and youth tickets from $13. Learn more. We’re sending a musical Christmas card to you! Join the Kansas City Symphony and Chorus for this spectacular holiday celebration filled with lush symphonic arrangements of Christmas classics, fresh versions of your favorite carols, and many melodic surprises. Share the spirit of the season with your entire family as you enjoy enchanting performances by the Symphony, Symphony Chorus, Allegro Children’s Choir, the Rezound! Handbell Ensemble and a special early visit from Santa Claus! At each performance, we’ll give away a dazzling piece of diamond jewelry from Helzberg Diamonds, no purchase necessary. Sponsored by Helzberg Diamonds. Adult tickets from $30 and youth tickets from $15. Learn more. What’s this, what’s this?! It’s the wildly inventive world of Tim Burton’s macabre classic shown in its entirety on a huge screen in Helzberg Hall for this Screenland at the Symphony presentation. 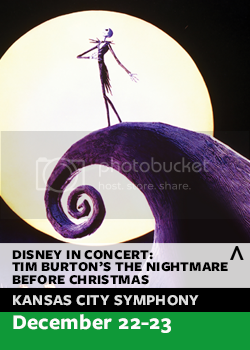 Danny Elfman’s rambunctious, colorful score will roar to life in the hands of the Kansas City Symphony as you follow Jack the Pumpkin King’s quest to seize Christmas. Sponsored by Hallmark. The movie will be presented with out intermission. Adult tickets from $40 and youth tickets from $25. Learn more. For more information and to purchase tickets, contact the Symphony Box Office at (816) 471-0400 or visit kcsymphony.org. The Symphony offers a range of ticket prices and packages. Group and senior student discounts are available.